We had a young man come to us with his grandmother’s antique brooch. It was old, slightly tarnished and filled with swirls and engraving, but it also had a fabulous, hand-cut European diamond in the center that he wanted to use in a custom engagement ring. The young man had been to other jewelers in town who told him the stone was junk, because of the cut and wasn’t worth much. They obviously wanted to sell him one of their many, instock diamonds instead, and weren’t interested in the brooch. But the diamond was important. It was a gift from his beloved grandma. And he wanted to use it somehow for his new bride-to-be. The trouble with older, hand-cut diamonds is that they aren’t a standard size and can’t be plopped into a mass-produced mounting purchased from a mall store. And that’s why some jewelers don’t want to use them. These antique diamonds deserve a one-of-a-kind ring to show them off. But that’s where we, at Scott’s Custom Jewelers hit major home runs. 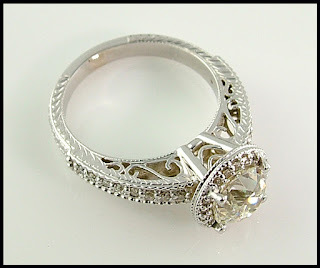 Creating custom jewelry is the hallmark of our business and we’re happy to work with any kind of stone. Because it’s really about the story, isn’t it. For this particular ring, we handcrafted a gorgeous 14k white gold ring and set Grandma’s stone in a dazzling halo of diamonds. 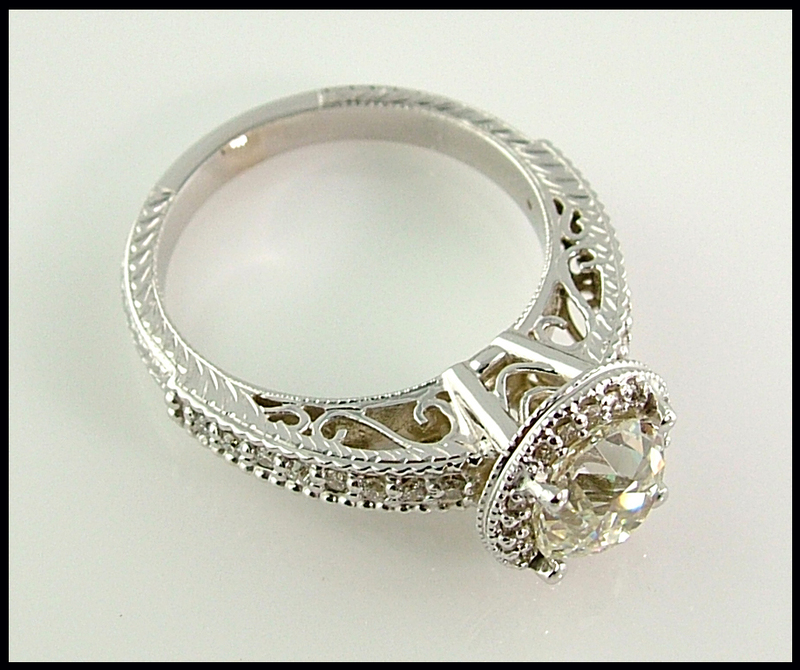 The filagree curves on the side were copied from the original brooch, and we added hand engraving to give it a vintage ring vibe. The result? A beautiful, affordable (our pieces typically cost less because you’re using your diamonds and not paying for a big shot name) custom engagement ring, ready for the next generation to enjoy.